Milbridge Commons Opens with Celebration! Milbridge Commons, a community wellness park and garden, will officially open on Saturday, October 20 from 11 AM to 2 PM. The shoreline park is located on Main Street in Milbridge across from the Milbridge Historical Society building. Festivities will include a potluck picnic, hot dogs, and a visit from the Darling’s Ice Cream Truck. Local restaurants providing side dishes include 44 Degrees North, the Milbridge House, and Vasquez Mexican Takeout. An Incredible Edible Super Salad Competition will be judged by the public. Categories include the most colorful, most original and the tastiest. Anyone wishing to participate in the salad competition can get more information at whrl.org/salad/. Musical guests will include Cole Creek and others. People are encouraged to bring their own instruments for an impromptu jam session. For the kids, there will be pumpkin decorating; pumpkins and art supplies will be provided. A separate pumpkin carving competition invites folks to bring their already carved pumpkins from home to compete for the scariest, funniest, most original, and most elaborate. Local artist Maeve Perry will be on hand for face painting. There will also a variety of games for kids and families. All activities are free. Parking is available at Camden National Bank and Wyman’s. Visitors are encouraged to bring their own blankets or lawn chairs. Milbridge Commons painting Janie Snider. 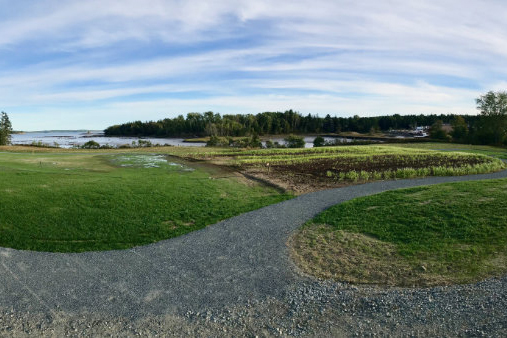 The Milbridge Commons property was purchased and conserved by Maine Coast Heritage Trust in 2015. MCHT joined forces with the Women’s Health Resource Library to create a community wellness space complete with a walking track, an Incredible Edible organic vegetable garden, an open area for free play, and a children’s play space. Donations from the community as well as foundation support have provided funding for this first phase of a four-phase project. Funds are still needed to complete the children’s playground, slated for construction next spring. Other features planned for future phases will include an orchard, an amphitheater, a performance area, a stone labyrinth, and various sculptures. For more information about Milbridge Commons, visit www.milbridgecommons.org.